The often terrible economic and political costs of hyperinflation have made it a topic of enduring interest for economists and public alike. 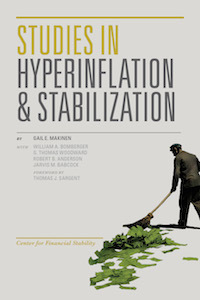 In this book, Gail Makinen and his coauthors examine 20th century hyperinflations in China, Greece, Hungary, and Taiwan, plus high inflations in South Korea and South Vietnam. How did they happen? What were the consequences? How did they end? By pulling the episodes together, the book throws light on common patterns of error and success in dealing with hyperinflations. The introductory chapter surveys the themes of the various case studies. In the preface and postscript, the authors discuss the lessons of these episodes and whether hyperinflation is a realistic possibility in the leading economies today. Governments must avoid substituting money creation for taxation. Inflationary finance can only be temporary. Monetary control is essential for stabilization. The costs of stabilization are smaller than the costs of hyperinflation. Distinguishing good from bad stabilization plans can be difficult. Public policy often worsens inflation. Real money balances provide an early signal of successful stabilization programs. Hyperinflation need not directly involve the foreign exchange market. The inflation rate is likely to accelerate over time. The authors are making available the data underlying the book, thereby adding significantly to the body of statistics on hyperinflation. Gail E. Makinen, the author, is Adjunct Professor at the Georgetown University McCourt School of Public Policy. He has also taught at Wayne State University in Detroit, where he received his Ph.D., and George Mason University. For nearly 20 years, he was a Specialist in Economic Policy at the Congressional Research Service of the Library of Congress in Washington, D.C. He also spent four years as the Principal Macroeconomist for the U.S. General Accounting Office (now the Government Accountability Office). Makinen has written extensively on monetary theory and policy: this is his eighth book, and he has also published more than 30 articles in refereed academic journals, chapters in edited works, and encyclopedia articles. William A. Bomberger is an Associate Professor of Economics in the Warrington College of Business at the University of Florida. He has also taught at Wayne State University and has served as a Visiting Scholar at the Congressional Research Service of the Library of Congress. Bomberger has a Ph.D. from Brown University. G. Thomas Woodward is now retired after having served as an economist and manager in the Congressional Budget Office, the U.S. General Accounting Office, the Congressional Research Service of the Library of Congress, and the Budget Committee of the U.S. House of Representatives. He has a Ph.D. from Brown University. The late Robert B. Anderson met Gail Makinen when both were professors of economics at Wayne State University. Anderson later worked at the U.S. General Accounting Office, the Board of Governors of the Federal Reserve System, and the U.S. Office of Management and Budget. He did his graduate work at Johns Hopkins University. The late Jarvis M. Babcock taught economics at Wayne State University, the University of Michigan, and Oberlin College, and served on the staff of the Council of Economic Advisers. He did his graduate work at Iowa State University. Excerpt includes table of contents, preface, sample chapters, and index.